Many of us have a kitchen remodel in mind, and we long for the day when we’ll finally be able to customise our cooking space. However, when that day arrives, it can be very disruptive to daily living. Kitchen remodelling is a big task, and the one that requires a lot of planning. Before you start redoing your kitchen, you should know that it’s not something to be approached rashly. So, before you go ahead with your remodelling plans, read our tips and advice on getting the best results at the right price. Unless your house was built within the last few years, your kitchen is most likely undersized. So, if you are doing major kitchen remodelling, you should consider expanding the room where the kitchen is located. Here is how you can do it without significantly hurting your budget. Steal some space—Look for the rooms where you can repurpose square footage from. For example, it can be from an adjacent hallway, a laundry, or even mudroom. This way you can get some extra space and create a super-functional kitchen. Merge the rooms—You can make your kitchen look bigger even without stealing space from other rooms. All you have to do is take down a wall that separates the kitchen from the adjacent family or dining room and create an open floorplan. However, this is a significant renovation project, and as such, it may cost you up to $7,000, depending on whether the wall contains electrical lines or plumbing. A great lighting plan can make your kitchen look spectacular. 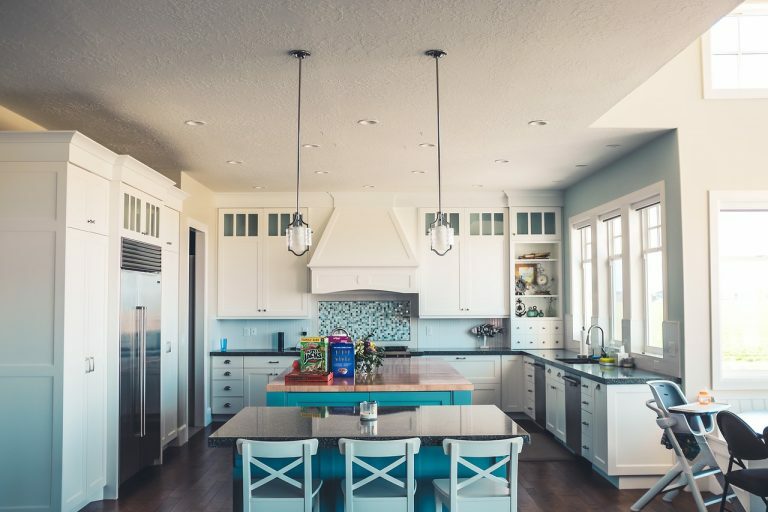 If your kitchen has only a few ceiling lights and a small window over the sink, it’s time to renovate! Give these ideas some thought while planning your kitchen remodelling project. If your windows are old and small, replace them with larger ones that will let in more light. Control the amount of light throughout the day by putting dimmer switches on lights. Use Xenon undercabinet lightning—it offers the same amount of light as halogen, but without generating the heat. Almost every kitchen expert will tell you that keeping the kitchen’s existing layout is a great way to save money on the remodelling project. Of course, that doesn’t mean that every new add-on must be in exactly the same place as the old one. Renovation costs for major systems can be expensive, which is why we recommend that you leave plumbing, heat, and gas systems intact. Furthermore, upgrading ducts and vents could also result in added expenses. « Cryptocurrencies – Will they Affect Real Estate?